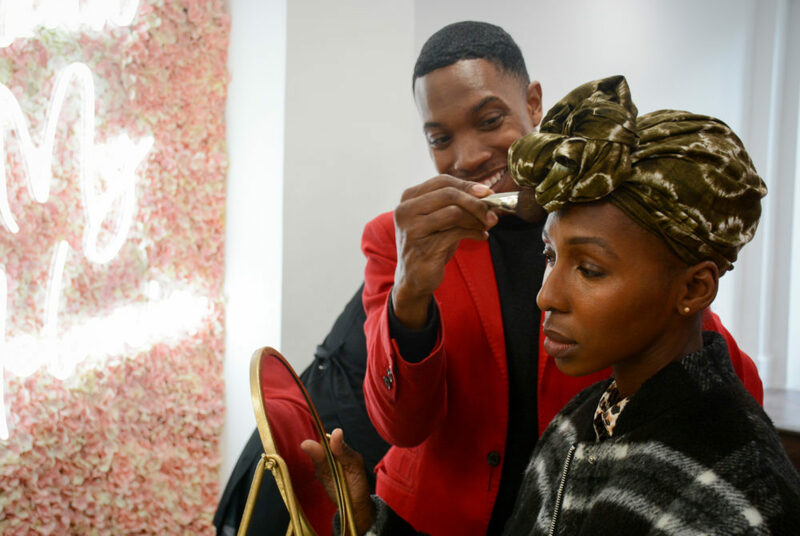 AJ Crimson tests beauty products on Namatie Mansaray at the Brown Beauty Co-Op opening celebration Saturday. A new beauty store in Dupont Circle lines its shelves with products designed with people of color in mind. Brown Beauty Co-Op offers skincare, hair and makeup products from various brands for people of color. The store’s location at 1365 Connecticut Ave. NW opened Saturday. Inside the pink-and-white painted store, brands that range from smaller local companies to established national brands including Breedlove Beauty Co. and Hur Noir are available, and products in the store have prices that top out at $59. Throughout the space, signs and pillows are plastered with empowering phrases like “flexin’ my melanin” and “you are beautiful” that match the store’s mission. Customers can receive complimentary foundation matching to be sure they leave with the perfect shade and attend in-store makeup and hair classes hosted by local businesses featured in the store. The owners also plan to offer a student discount starting in the new year. Brown Beauty Co-Op is the brainchild of two unrelated best friends with the same last name, Amaya Smith and Kimberly Smith. The co-founders said they struggled to find makeup designed for their darker skin and wanted to open Brown Beauty Co-Op to serve individuals facing similar issues. Kimberly Smith – who owns Marjani Beauty, a cosmetics site focusing on women of color with products from around the world – said for her latest venture, she wanted to specifically support people in the D.C. area. Amaya Smith is also no stranger to the beauty industry. She is the founder of Product Junkie, which sells products for women’s natural hair. In the new year, the pair plans to expand their new company to also serve as an incubator focused on mentoring owners of local businesses, including beauty entrepreneurs. Brown Beauty Co-Op is open from 10 a.m. to 8 p.m. Monday through Friday and from 11 a.m. to 8 p.m. Saturday and Sunday.